Thanks for interest! We'll get back to you as soon as we can! Get to Know the Best Kept Secret in Carmichael! Three eggs, ham, bacon, onions, mushrooms and cheese. Three eggs, feta cheese, dill, kalamata olives and tomatoes. Thre eggs, ham, sauteed jalapenos, onions, peppers and cheese. Three eggs, bacon and cheese of your choice. Sauteed shrimp, onions, mushrooms and cheese, topped with hollandaise sauce. Two eggs, sauteed onions, ham, mushrooms and cheese. Three eggs, sauteed onions, mushrooms, spinach, tomatoes, avocado and cheese. Three egg whites, sauteed mushrooms, spinach, onions and peppers, served with sliced tomatoes (or fruit) and dry wheat toast. Three egg omelet with sauteed mushrooms, onions, chicken apple sausage and cheese, served with fresh fruit and wheat toast. Two poached eggs and ham on an English muffin, topped with hollandaise sauce. Served with country potatoes and fresh fruit. Two poached eggs, sauteed spinach, sliced tomato and avocado topped with hollandaise sauce. Served with country potatoes. Strawberry cream cheese stuffed French toast, served with two eggs (any style) and two bacon or sausage. Breaded fried steak, served with our homemade country sausage gravy, two eggs (any style), a buttermilk biscuit and potatoes. Thinly sliced salmon, English cucumbers, tomatoes, capers, red onions and a toasted bagel with cream cheese. Corn meal waffle, two eggs of your choice, topped with fried chicken tenders smothered in country gravy. Whole grain belgian waffle, served with homemade whip cream and butter. Choice of pancakes or French toast, served with 1 egg and 1 bacon or sausage. With Belgian waffle add $1.00. Choice of 2 pancakes or 2 French toast, served with 2 eggs (any style) and 2 bacon or sausage. With chicken apple sausage add $1.00. With Belgian waffle add $1.00. with country potatoes and toast. served with country potatoes and toast, topped with country gravy. with country potatoes and corn tortillas. Sauteed chorizo, three eggs, onions and cheese, wrapped in a flour tortilla, served with country potatoes and fresh salsa. Sauteed steak, onions, mushrooms, and three eggs all wrapped in a chipotle tortilla, topped with roasted red pepper aioli sauce. Served with country potatoes. Sauteed onions, tomatoes, mushrooms, spinach, cheese, avocado and three eggs or egg whites. Served with country potatoes or chips and salsa. Sauteed ham, onions, mushrooms, eggs and cheese, wrapped in a flour tortilla. Served with country potatoes and salsa. Grilled sourdough bread, fried egg, ham and cheddar cheese, mayo and tomatoes served with chips and salsa or country potatoes. Shawna's Breakfast Favorite. Egg whites, jalapenos, Swiss cheese, lite mayo with tomato, avocado and spinach on a wheat, thin muffin (grilled sourdough, wheat or rye bread upon request). Served with fruit or chips and salsa. Two eggs scrambled with cheese, wrapped in a flour tortilla, served with chips and salsa. One plain pancake, one bacon or sausage and one scrambled egg. One blueberry pancake, one bacon or sausage and one scrambled egg. One chocolate chip pancake, one bacon or sausage and one scrambled egg. Mayo, lettuce, tomatoes, red onion and cheese. Mayo, lettuce, tomato, red onion and cheese. Bacon, lettuce, tomato and mayo on toasted bread of your choice. Bread of your choice, mayo, cream cheese, avocado, mushrooms, tomato and onions. Sliced turkey, bacon, mayo, lettuce, tomato and ranch dressing wrapped in a spinach tortilla. Albacore tuna, mayo, lettuce, tomato, red onion and cheese. Grilled turkey, sauteed mushrooms, Swiss cheese, mayo, tomatoes, lettuce and onions on grilled sourdough. Grilled chicken, mayo, lettuce, tomato and onion on grilled sourdough and cheese of your choice. Grilled chicken breast with bacon, grilled mushrooms, onions, jalapenos, mayo, lettuce, tomato and choice of cheese on grilled French roll. Provolone and cheddar on grilled sourdough or wheat bread. Albacore tuna, mayo, tomato, lettuce and onion on grilled bread with cheese of your choice. Roast beef with barbecue sauce on a grilled French roll. Roast beef thinly sliced on a grilled French roll with Au-jus. Add cheese for $1.00. Grilled pastrami, sauerkraut, thousand island dressing and Swiss cheese on grilled rye bread. Grilled ham, turkey, Swiss cheese, thin layer of strawberry jam on egg-dipped Texas-style toast, grilled then dusted with powdered sugar. Grilled turkey, mayo, lettuce, tomato and onion on grilled sourdough bread and cheese of your choice. Sauteed steak, onions, nacho cheese and mayo on a grilled French roll - may request cheddar, Swiss, provolone or pepper jack cheese. Add $2.00 for grilled chicken, tuna, hamburger patty or Quinoa Patty. Vegetarian Option Mixed greens, tomatoes, red onion, garbonzo beans, kidney beans, Lido's homemade croutons and Parmesan cheese. Romaine lettuce, Lido's croutons, Parmesan cheese and our Caesar dressing. Fresh spinach, red onions, fresh strawberries, Parmesan cheese, Lido's croutons, English cucumbers, tomatoes and housemade bacon dressing on the side. Nappa cabbage, tomatoes, red onions, peanuts, Asian noodles, Parmesan cheese, grilled chicken and our own Chinese dressing on the side. Mixed greens, tomatoes, bacon, grilled chicken, hard boiled egg, avocado and bleu cheese crumbles with choice of dressing. All burgers served with chips and Lido's salsa. 1/3 lb. ground sirloin, mayo, tomatoes, onions and lettuce on a grilled bun. 1/3 lb. ground sirloin, melted cheese (cheddar, Swiss, provolone, or pepper jack), mayo, tomato, onion and lettuce on a grilled bun. 1/3 lb ground sirloin, chili, cheese and onions. 1/3 lb ground sirloin, sauteed mushrooms, grilled onions, jalapenos, crispy bacon, melted Swiss cheese, mayo, lettuce and tomato on a grilled bun. 1/4 lb turkey burger, melted cheese, mayo, lettuce, tomato and onions on a grilled bun. 1/3 lb ground sirloin and grilled onions on rye bread with melted Swiss cheese and mayo. Vegetarian Option Veggie burger, melted cheese, mayo, tomatoes, lettuce and onions on a grilled, thin wheat or regular bun. Vegetarian Option Grilled garden burger with Swiss cheese, jalapenos, mushrooms, mayo, tomatoes and lettuce on a grilled, thin wheat or regular bun. Gluten-free, served on a regular bun, gluten-free bread or a thin wheat bun with mayo, lettuce, tomato, onion (cheese optional). Served with chips and Lido's salsa. 1/4 lb. beef dog, ketchup, mustard, onions and tomatoes on a grilled bun. 1/2 lb. grilled dog with chili, cheese and onions. On a grilled French roll, topped with marinara sauce and provolone cheese. with onions. Add sour cream for an extra $0.75. Served with toasted baguettes or homemade chips. Served with ranch dressing or marinara sauce. Spinach or flour tortilla with mixed cheese. Add sour cream/jalapenos for $0.50. Add grilled chicken for $2.00. House-made small buns with ground sirloin ($8.95), chicken ($9.95) or New York Steak ($11.95), with mayo and arugula lettuce. Add $2.00 for grilled chicken or tuna. Add $3.00 for shrimp. Vegetarian Option Mixed greens, tomatoes, red onion, garbonzo beans, kidney beans and croutons with Parmesan cheese. Romaine lettuce, croutons, Parmesan cheese and house made Caesar dressing. Nappa cabbage, tomatoes, red onions, grilled chicken breast, peanuts, Asian crispy rice noodles, mandarins, Parmesan cheese and our house made Chinese peanut dressing. Fresh spinach, English cucumber, red onion, fresh strawberries, Parmesan cheese, croutons and our house made bacon dressing. Mixed greens, chicken breast, tomatoes, avocado, bacon, chopped hard boiled egg, bleu cheese crumbled, served with your choice of dressing. Mixed greens, tomatoes, cucumber, garbonzo and kidney beans, red onions, hard boiled egg, bleu cheese crumbles, parmesan cheese and croutons. On a grilled French roll with our Marinara sauce and Provolone cheese. With sauteed grilled onion and house made aioli and arugula. Breaded white fish fried and topped with lemon tarragon tartar sauce on a grilled roll. On pita bread with feta cheese, pesto, spinach, tomatoes and mayo. with aioli, provolone cheese and arugula. Grilled chicken, mayo, lettuce, tomato, onion on grilled sourdough and cheese of your choice. Grilled chicken breast with bacon, grilled mushrooms, onions, jalapenos, mayo, lettuce, tomato and your choice of cheese on a grilled French roll. Grilled chicken breast, sauteed mushrooms, onions, mayo, lettuce, tomato and provolone cheese on a grilled tortilla. Burrito wrapped upon request. Albacore tuna, mayo, tomato, lettuce, onion and your choice of cheese on grilled bread. Roast beef, thinly sliced on a grilled French roll with au-jus. Add cheese for $1.00. All house made burgers served with soup, salad or French fries. 1/3 lb. ground sirloin, house made aioli, tomatoes, onions and lettuce on a grilled bun. 1/3 lb. ground sirloin, melted cheese (cheddar, Swiss, provolone, or pepper jack), house made aioli, tomatoes, onion and lettuce on a grilled bun. 1/3 lb ground sirloin, sauteed mushrooms, grilled onions, jalapenos, crispy bacon, melted pepper jack cheese, aioli, lettuce and tomato on a grilled bun. 1/3 lb ground sirloin, crispy bacon, sauteed mushrooms, pepper jack cheese, avocado, aioli, lettuce and tomato on a grilled thin wheat or regular bun. 1/3 lb ground sirloin patty with grilled onions on rye bread with melted Swiss cheese and mayo. 1/3 lb ground sirloin with sauteed mushrooms, Swiss cheese, crispy bacon, mayo, lettuce, tomato and onions on a grilled bun. Vegetarian Option Veggie burger, melted cheese, mayo, tomatoes, lettuce and onions on a grilled thin wheat or regular bun. Vegetarian Option Grilled garden burger with jalapenos, mushrooms, Swiss cheese, mayo, tomatoes and lettuce on a grilled thin wheat or regular bun. Gluten-free, served on a regular bun, gluten-free bread or thin wheat bun, mayo, lettuce, tomato and onion. All dinners served with soup or salad. Flame broiled with mashed potatoes & gravy or French fries. with spinach, mushrooms and feta cheese. Served with orzo pasta and sauteed vegetabes. Fresh cod, house made dipping sauce with golden fries. Served with mashed potatoes, country gravy and vegetables. Chicken ($13.95), steak ($14.95), tilapia or salmon ($15.95), served with beans and Spanish rice. Served with orzo pasta or mashed potatoes & gravy, and vegetables. A mild white fish topped with mango salsa, served with orzo pasta and vegetables. Served with mashed potatoes & gravy. Tender pork, green tomatillo sauce, served with Spanish rice and beans, corn or flour tortillas on the side. Italian sausage, ground sirloin, ricotta cheese and marinara sauce, layered with spinach and cheese. Spaghetti with marinara sauce, topped with meatballs or Italian sausage and Parmesan cheese. With sauteed garlic, roma tomatoes, fresh basil and Parmesan cheese. Chicken - add $2.50. Shrimp - add $4.50. In a marinara sauce with Alfredo and Parmesan cheese. Sauteed chicken, linguini pasta, artichokes, tomatoes, spinach and garlic in a white wine lemon sauce. Sauteed ham (or shrimp - add $3.00), French green beans, mushrooms, garlic, onion and tomatoes in a light cream sauce. Lightly breaded, served with pasta topped with marinara and Alfredo sauce. All doggie meals come with a bowl of water. Proud owners Don and Shawna Rivera would love to welcome you to Lido's warm atmosphere and fantastic home cooking! Shawna started her career as a cosmetologist. After fifteen years, she decided she wanted to follow her passion for cooking and went to culinary school at LederWolff Culinary Academy. After graduation, Shawna opened Lido, a café and hair-salon. It's been great having her family, including her husband and co-owner Don, together working as a team on what it is she loves to do! The café has become "the Best Kept Secret in Carmichael" because to this day someone will always say, "I never knew you were here and I've lived here for so many years!" Shawna's dream for Lido's came from her mother's gift of cooking and how it 'brings you home'. 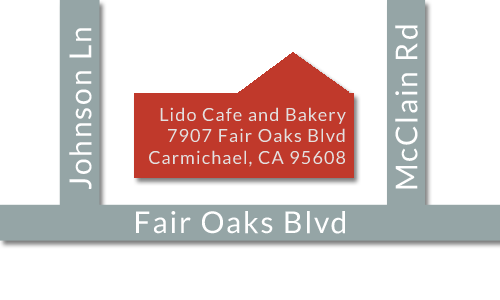 Lido's is our home and we love to have you come, eat and visit. We can't do it without you! Thanks to everyone who has been a part of Lido's!